The answer is somewhat. 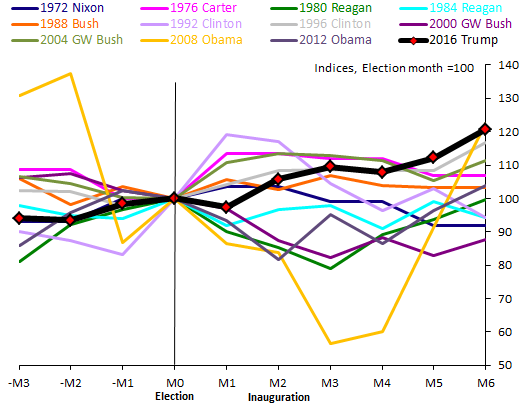 The first chart shows The Conference Board’s Consumer Confidence Index around US Presidential elections since 1970. For the majority of Presidents, consumer confidence has been higher by their inauguration compared to Election Day. What has been unusual this time around is how sustained the pickup has been. Half a year on from the election, consumer confidence has improved by more under Trump than under any of his recent predecessors. But what can explain this? Some of this could reflect genuine increases in optimism under the new President, while some work has suggested partisan effects have played a role in the boost. More generally though, confidence measures are at least in part, likely to reflect existing economic conditions. 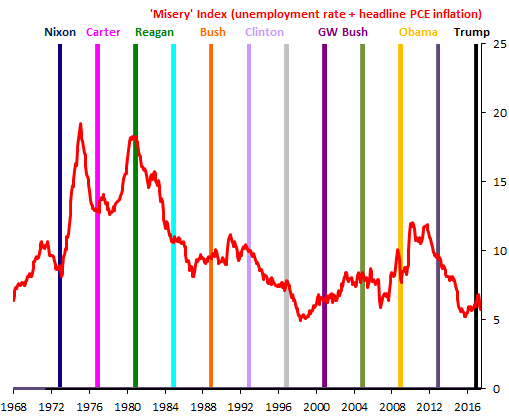 The second chart shows the disparity in economic conditions each new president has faced, through the ‘misery’ index. Introduced by Arthur Okun, the index provides a simple summary statistic of macroeconomic health. It shows that no other President for at least half a century has inherited a more jovial economy than Trump did. In contrast, both Obama and Reagan inherited economies either suffering or on the verge of severe distress. Understandably, consumer confidence waned, at least initially, under both. So while the protracted rise in consumer confidence under Trump has been unusual, so was the condition of the economy he inherited. Thomas Viegas and Emil Iordanov work in the Bank’s International Surveillance Division. Next Post Car finance: what’s new?